I wish you UTS as a star, Everafter67 ! The cure should really throw everyone off and open set With A Japanese dream. 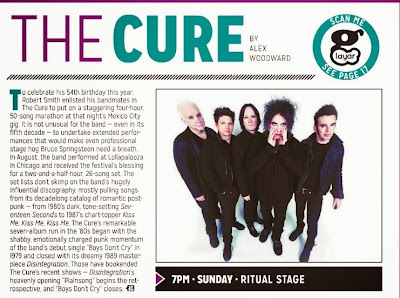 The cure forever !!!!!!!!! Luv ya luv ya. I never understood why they stopped opening with UTS. It was a great opener. I believe Voodoo was webcasted a few years ago. No news in regards to this year? Forget that. Open with "Out of this World." And play "A Japanese Dream" and "Chain of Flowers." "The band - now in its fifth decade"
Gee thanks. That makes the band sound REALLY old. Hey, so are there any plans to have a meet-up somewhere in NOLA? I am braving this festival alone, and it would be nice to meet some other Cure fans along the way. Im coming down Pennsylvania, would love to get together with the COF peeps!